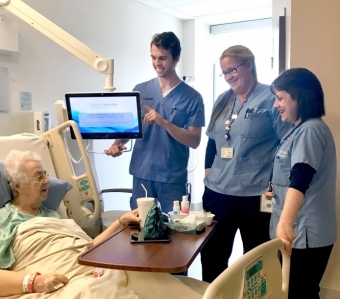 The program has only been running for seven months, but already we are seeing dramatic improvements in patient care thanks to the We Round initiative. Every two hours, patients in every clinical unit are asked about their pain, if their personal needs are being met, if their possessions are within reach, and if they are comfortable. Their medication pumps are also checked as needed. It’s a structured, proactive approach to rounding. Patients say they feel their needs are being met through this program, and appreciate the level of monitoring they are getting from their care teams. Patient Helen Birch, 82, said she noticed a difference in the level of care she’s received since We Round was introduced on the surgical unit in St. Catharines. She had surgery in June before We Round was implemented, and again in January after it was adopted by staff. We Round was phased in last summer and has now been implemented on most clinical units in all sites. Jocelyn Dooley, Manager of Unit 5B at the St. Catharines Site, who helped implement We Round when she was a nurse educator, said she’s seen dramatic improvements to patient care. We Round is a key part of the Extraordinary Care initiative – safe sharing and exchange of information in our strategic plan.